Our laundry room is definitely the most overlooked room in the house. I don't like going in there at night because there isn't a curtain, and we kind of throw everything in there - from shoes to tools to bags of stuff to donate. It's more of a catchall for stuff. But it doesn't have to be like that! There are so many cute little laundry rooms that have been transformed by just a little paint, some good organization, and a couple pretty accent pieces. I've been inspired. It's Tuesday! Link up at Communal Global! I'm ready! Let's do a before and after of mine! What a brilliant post, I love the first one so much:) Totally need to do something with my laundry room:) Hugs and kisses, darling. Hey you won my giveaway on Newlyweds Next Door for the $100 gift card! Please email me ASAP at newlywedsnextdoor@gmail.com. oh wow...this is my dream!! 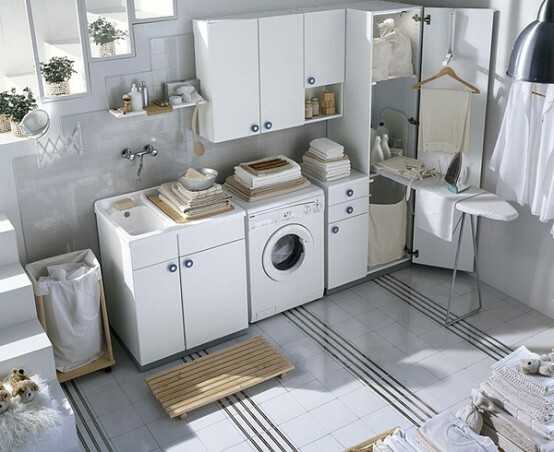 I can't wait until I have my very own laundry room to decorate! I'm rather partial to that one of a small washer/drier stack. How clever.